This weekend, TEAM USA won the overall Silver Medal at the Pan American Racquetball Championships being held in San Luis Potosi, Mexico. The Men's Team also won Silver and the Women's Team took Bronze. Mexico captured top honors in all three team competitions. Individually, Jake Bredenbeck won his second straight Silver Medal at the Championships. In Women's Doubles, Kelani Bailey and Michelle Key also won a Silver Medal. The Men's Doubles team of Bredenbeck and David Horn won a Bronze Medal. All TEAM USA members, including the coaching and support staff, contributed greatly to the overall performance. Congratulations to the TEAM and staffon a strong performance! Rocky Carson, 36, of Ladera Ranch, Calif., qualified for the delegation by finishing as the top American on the International Racquetball Tour (IRT) for the 2014-15 season. The four-time World Champion will be defending his 2011 Pan Am Games Gold medal won in Guadalajara. Jake Bredenbeck, 23, of Chandler, Ariz., earned a position on the Team with his victory at the 2015 U.S. National Singles Championships. This will be his first Pan Am Games appearance. Jansen Allen, 25, of Rice, Texas, and José Rojas, 25 of Stockton, Calif., are representing TEAM USA after winning the 2015 U.S. National Doubles Championships. Both players will be competing in their first Pan Am Games. Rojas, who finished as the second-highest ranked American on the IRT, and therefore qualified to compete in Singles competition, elected to focus on Doubles. Rhonda Rajsich, 36, of Fountain Hills, Ariz., qualified for the #1 Women’s Singles position by finishing as the highest ranked American on the Ladies Professional Racquetball Tour (LPRT) at the end of the 2014-15 season. The third-ranked player in the world will be seeking her third Pan Am Games individual medal. Michelle Key, 26, of Gilbert, Ariz., finished as the second-highest ranked American on the LPRT and will represent the Team as its #2 Singles player. She will be participating in her first Pan Am Games. Kim Russell-Waselenchuk, 47, of Austin, Texas, won the 2015 U.S. National Doubles Championships with her partner, Rhonda Rajsich. Russell-Waselenchuk is a two-time Doubles World Champion and won a Silver medal in Doubles at the 2003 Pan Am Games. 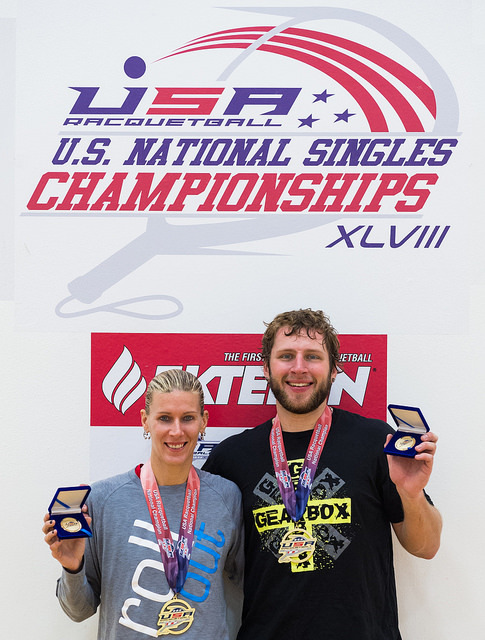 Highlands Ranch, Colo. – Rhonda Rajsich of Fountain Hills, Ariz. and Jake Bredenbeck of Chandler, Ariz. have respectively won the Women’s and Men’s Singles titles at the 2015 U.S. National Singles Championships presented by Penn, Ektelon and Wilson. Both players successfully defended their 2014 victories. In doing so, they have qualified for the 2015-16 U.S. National Team. Rajsich defeated long-time rival Cheryl Gudinas in the two-game final, 15-7 and 15-5. She won her eighth National Singles title, tying Gudinas for the most all time. Combined, the two players have won 16 of the last 17 National Singles Championships. As a result of her victory, Rajsich has again triple qualified for the U.S. National Team, having finished as the top American on the LPRT and won the National Doubles title with partner Kim Waselenchuk. Rajsich will represent the U.S. at this summer’s Pan Am Games. Bredenbeck won his second consecutive National Singles title by defeating Marco Rojas in two games, 15-8 and 15-11. He got past local favorite, Adam Manilla, in the semifinals. Bredenbeck has qualified for the U.S. National Team for the second time. Runners-up Gudinas and Rojas have also qualified for the U.S. National Team. Rajsich, 36, of Phoenix, Ariz., continued to dominate national and international play among Americans over the last year. She is receiving this award for the seventh time, her fifth straight. Rajsich won the 2014 U.S. National Singles Championships and earned a silver medal at last year’s IRF World Championships in Canada. Along with partner Kim Russell-Waselenchuk, Rajsich took the title at this year’s National Doubles Championships. She also won a silver medal in doubles at the 2014 PASO Pan American Sports Festival in Mexico. Bredenbeck, 23, of Chandler, Ariz., had a breakout year competing in national and international championships. He won the 2014 U.S. National Singles Championships and also finished second at the recent Pan American Racquetball Championships held in the Dominican Republic. Additionally, Bredenbeck medaled in both singles and doubles competition at last year’s PASO Pan American Sports Festival in Mexico.